Get a 12 volt coffee maker only when you really need it. As in, if you are always on the road, or going for some long haul sailing then maybe you should purchase this machine. Nope, I absolutely have nothing against the 12 volt coffee maker, but to me, the value add of these machines are low. For example, if you are thinking of mobility, and dream of how convenient it would be to be able to make coffee at home and in the car using the same machine -you are probably affected by the sales pitch! 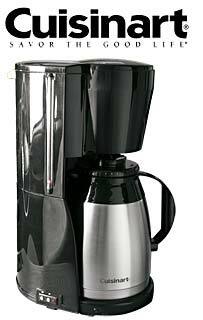 Seriously, if you are looking for great coffee (let's forget about starbucks for the moment) home brewed style -my recommendation would be good coffee travel mugs rather than these 12 volt coffee maker. You brewed it at home, using the beans you like, the style you enjoyed, stored it in the container and you can still get great hours after many hours. Now, residing in a country less than 50 km in length, you can say that I would not appreciate the value of these 12 volt machines. Which bring us to the point on long haul travelling. And that is the real value of these machines, the ability to make coffee using power supplied by vehicles' generator. -what is the time required to make a full pot of coffee (5 cups). Usually,it would take a car generator approximately 45 minutes to make one pot. Of course, the shorter the time required, the better the coffee maker. -Does it come with a one cup option? There are times, where you just need one cup of coffee, it is possible. Again, what is the required time to make that cup of coffee. -What type of coffee pots should you be choosing? Most of the time, it would be the usual glass pot, this would be good for caravan. But, if you are using for boat, on the front seat, then stainless stell would be a better choice. -The designIn a normal setting, design of a coffee maker is merely aesthetic. But, if you are travelling and brewing a cup of coffee, it might be "life or death". Imagine the disturbance spill coffee can bring to you! So, ergonomic handle is important in this aspect. -CE certifiedThere are tons of cheap machines out there (plenty are from China), so when choosing these 12 volts coffee makers,look for the CE certification. Generally, it means passing European standard for safety. **CE is an abbreviation, stood for Communauté Européenne, French for European Conformity. Hope, the above is helpful in searching for that companion on your next road trip. Just another pointer for those on the road, most 12 volt work best when you are really 'on the road', driving.